had a hockey team in 1901 that played informal games with teams from the surrounding area according to the 1985 Michigan Tech Centennial book. 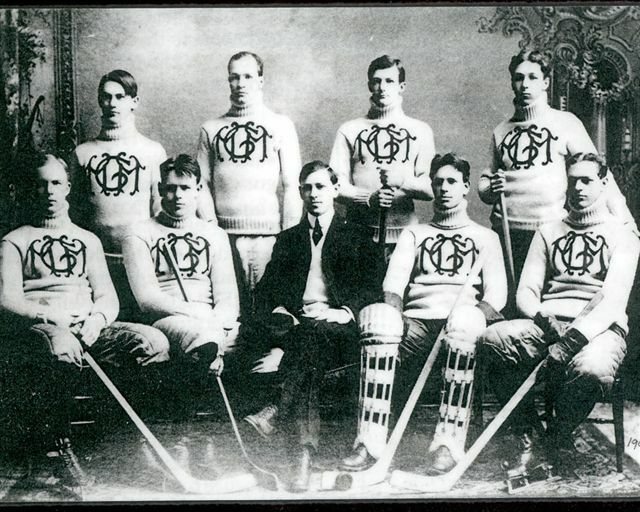 A photo of the 1903 MCM team appears here. Members of this early team were: Standing Lt to Rt: "Soo" Bailey, Carl Dunster, "Davey" Davidson, George Botsford. Seated: Ned Churchill, Alex Campbell, Frank Wheeler, John Rea, Carson Smith. Some of the first coaches of the early Michigan Tech teams were Leon Harvey, Elmer Sicotte, Carlos (Cub) Haug, and Ubald J. (Bert) Noblet. Coach Noblet was hired in 1929 by the college to direct the athletic department and coach their teams. Coach Noblet arranged for the hockey team to go on a tour to play against prominent Ivy League schools. Tech only won one game, but made the East aware of its hockey program, the program moved from competing against local teams to become an intercollegiate sport. Michigan Tech's most notable coach was John MacInnes, who coached Tech hockey from 1956 to 1983. John compiled a record of 555-295-39 at Michigan Tech, he was Nationally recognized at that time as being the winningest coach in college history! Under his coaching, Tech won the NCAA National Hockey Championships in 1962, 1965 and 1975. Coach MacInnes was named NCAA Coach of the Year in 1970 and 1976, and he received the NHL's Lester Patrick Award for service to hockey in the U.S. in 1986, WCHA Coach of the Year six times, and was a charter member of the Upper Peninsula Hall of Fame in 1972. Born in Toronto, Ontario, he played goalie for the University of Michigan and also played for the Boston Bruins and the Detroit Red Wings before coming to MTU in 1956 as hockey coach. He died in 1983, shortly after retiring from coaching for health reasons. Jamie Russell is the current Tech hockey coach. Hockey is the only sport where Michigan Tech participates at the Division I level, all other Tech athletic teams are in Division II. Hockey is a popular sport for many students at Michigan Tech, in the 1983-84 school year, there were 52 intramural hockey teams, with over 10% of their students playing hockey. Over the years, many of Michigan Tech's hockey players were picked as First Team All-American including: Eddie Maki-G, Bob Monahan-D, John Kosiancic-W, Paul Coppo-C, George Cuculick-G, Gerald Sullivan-C, Louis Angotli-W, Henry Akervall-D, Elov Seger-D, Garry Bauman-G, George Hill-C, Bruce Riutta-D, Tony Esposito-G, Rick Best-G, Gary Milroy-C, Al Karlander-C, Rob Murry-D, Morris Trewin-G, Mike Zuke-C, Jim Nahrgang-D, Bob D'Alvise-C, George Lyle-W, Tim Watters-D, and Jamie Ram-G. Twenty one of these players were coached by John MacInnes. A wonderful History of Michigan Tech Hockey starting with the 1919 season, can be found on the Michigan Tech web page. 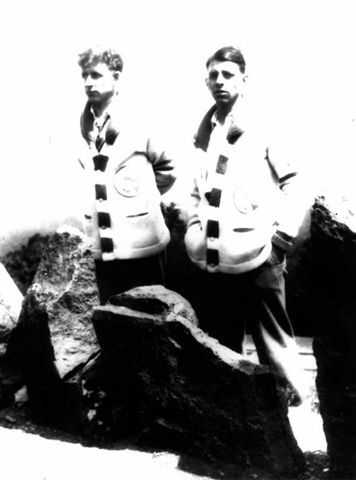 Two early hockey players from the Michigan College of Mines 1927-28 season were Curly Kolehmainen from Hancock, and Hank Latva pictured here in their MCM sweaters. Click here for Michigan Tech Website! If you have any info or pictures or additions/corrections for this web page, please contact the webmaster.